Gold Velvet Holiday Trim Sets. 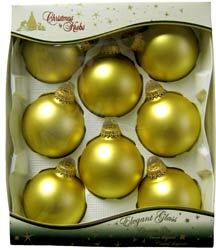 The gold velvet holiday trim sets come with eight 2 5,8 inch diameter ornament balls. Each have a matte finish with a soft sheen and come with a soft gold hanger caps. They come in a nice box that can be used as storage from year to year.